Throughout the furore over the NSA revelations, one thing that has remained constant is the way that technology companies and technologists have expressed a certain naiveté over politics. I do not mean that they are unaware of politics. Instead, I mean they are unaware of how or why their technological inventions would be used politically. For example, Ross Anderson a well known academic on computer security expressed surprise that the NSA were able to build the machine to monitor the internet. “To find that they had built this machine and got it working is an eye-opener,” he told the BBC. The question for me is why should this be a surprise? The atomic bomb project should teach any scientist or technologist that a state will use and exploit any technology. The the Manhattan project is the seminal event that shows technology and the modern state intersecting. 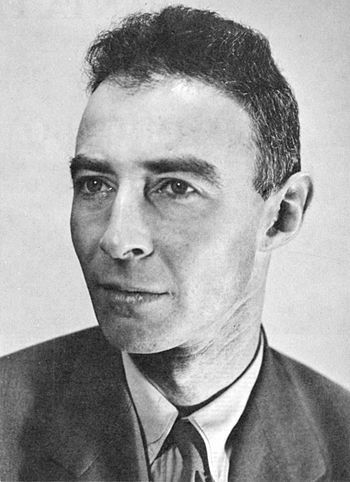 Robert Oppenheimer understood what it meant most clearly. However, all brilliant minds that made experiment to prove the weapon was viable understood its terrible consequences. None of the scientists left Los Alamos the same. They understood, perhaps deep down in places they never thought about, that their scientific prowess was no longer, and never was, a benign intellectual or academic exercise in knowing for knowing’s sake. The issue here is that scientists and technologists seem to forget that politics has not gone away. It remains despite the best efforts of technology to give us the appearance that it does not matter. The state will always seek to have the monopoly on violence or security within it. This is why the state and not an individual have nuclear weapons. This is why the state and not an individual have army, navy and air force. The state has an obligation to keep its citizens safe and to keep them safe, it must control or exploit the strategic high ground. The web is just another strategic high ground. As a technology it is no different from an atomic high ground. To believe otherwise, misunderstands the state’s role in protecting the citizen and the threats a state faces and must counter or mitigate to the best of its ability. If a state cannot mitigate or counter these threats, then it will lose legitimacy because it cannot meet the basic contract, which is to keep its citizens, and itself, safe. When a state loses its legitimacy it begins to lose it ability to sustain and defend the other rights to which it is designed to protect and promote. The web with its focus on benign communication and the potential for a democratic outcome has lulled us into a false sense of comfort and safety. We assume that the state, which keeps us safe, will not be interested in social media technologies. We have forgotten that the source of our access, at least in terms of technology is the state. We believe that because we have access to tools usually or previously reserved to a state means that we do not need the state. Google Earth satellite images give the public access to images that only a few of the most powerful states would have been able to access in 1972. Why would we assume or believe that the state would not attempt to exploit technology, as it did with the splitting of the atom, for its purposes, its political purposes? The state, by definition, is not interested in free enquiry or playing with ideas because its work is much too serious for such frivolity. If the state loses its strategic high ground, then it will be weakened. If the state is weakened, then those states who are less scrupulous in such matters, will exploit that vulnerability. What is the source of this lulled existence? One view is that technology, like science, is value neutral. It is neither good nor evil in itself. Thus, the intent for which it is used determines its value and determines its moral content. Thus, technology is empty of meaning or intent so the focus is only on those who use technology and the ends to which they use it. The challenge, though, mentioned above, is that the state has to work from the worst-case scenario, the exception, that can be found because of human nature. One only need to consider Google Glass and the late concerns about “creep shots” or the other ways it could be used. A contrary view, suggested by Heidegger, was that the essence of technology preceded technology and shaped the moral content that would judge or use technology. Thus, we find it increasingly difficult to judge (pass a moral judgement) on technology because it shapes us to such a degree we do not realize how our choices are already determined by it. As a result, modern natural science is only considered for what it provides, like a crude cost-benefit exercise, and not for its effect on the user. Our decisions and thinking to reach modern technology have shaped our understanding that we find it difficult, if not impossible, to think differently about it. We can see this in the maker culture. The idea that we build things with 3D printing seems to forget the underlying reality that enables 3D printing. The technology for 3D printing is based on and is a product of other technological decisions that were determined before the user sat down with the machine. The maker culture contains the idea that one makes the tools as well as the products. However, this seems to forget that people are not making their own microchips. In that regard, the “maker movement” presupposes a technological view of the world that only gives us the appearance of a return to a primary relationship with tools and making. Without perhaps being conscious of it, the maker movement makes technology the primary element of life and thus removes us further from a different understanding of our lives. The digital maker movement shares some interesting similarities to “Shakers” sharing the belief that “that making something well was in itself, “an act of prayer.”” Today, we pray to a technological god and to make something is is to worship at its altar. A third view, perhaps a hybrid of the two, is that science as philosophy expresses man’s deepest longings to know. Technology, as an expression of modern natural science can be used to serve that purpose without being reduced to cost benefit or used solely nor to relieve our human condition, nor becoming a nihilistic exercise where man simply becomes a slave to technology. However, that third view is a now perhaps a dream in that it relies upon wisdom and power to be reconciled without succumbing to either extreme. I doubt that we are educating our young to understand this view or educating them to begin to think about it. If we return to the presenting problem, we find that technology contains a moral content that cannot be escaped. The reason it contains a moral content is we are moral beings who live within a political context, within our cave. That context, for the time being, shapes our use of technology and shapes us. However, technology or rather its stepchild modern natural science appear to have succeeded in capturing how we understand the world. Even if we return from these dismal thoughts, we have to accept that people who use technology will not agree about its use. To determine its use, rather than technology itself, we have to return to politics. When we return to politics, though, we confront the problem anew because technology appears to remove the need for politics. Yet, to remove the need for politics means that technology has a settled understanding of politics and therefore about human nature. Unless we take a sceptical view of technology and subjects it to scrutiny and control based on our understanding of human nature, technology will dominate our lives and create that which we want to avoid without us even realizing it. This entry was posted in censorship, military, privacy, Uncategorized, war and tagged Bhagavad-Gita, Ethnography, Google Glass, History, National Security Agency, NSA, technology, Warfare and Conflict. Bookmark the permalink. Just no. I want I agree with you but your assessment of the modern political space is too rudimentary. States are ultimately governed by brute force. This is amply highlighted by Crimea in the current environment. ‘Cyberspace’ and the web is no different. So long as private companies can find value in the web, they will accede to the general view of free speech (albeit potentially) under surveillance. Once it becomes too hard, only state sponsored companies will do it for free. The right or wrong of this should be an issue, but it is not far enough on the radar to actually be effectively discussed. Thanks for the comment. I do not agree that the state is guided simply by force. It must be guided by an ideal beyond force. To paraphrase Thucydides the strong do as they will, the weak do as they must and only between equals can there be justice. Inside the state or political community there can be equality. This leaves the inequality between the states, which is why the states or political communities seek to exploit technology so that they do not become the prey of the powerful. Yet, even as the state does that it does it more than for mere survival. We live together no simply to avoid a violent death, we live together to experience the good life. The understanding of the good life, though can and is contested in a democracy, which is what leads us to be concerned with how technology is used to further that good life and the ways in which that technology and the good life intersect with what the state requires to survive.